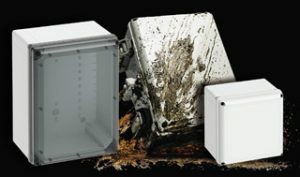 Altech Corp. introduced its GEOS harsh environment enclosures designed to prevent the ingress of harmful contaminants, resist corrosion, and withstand strong shocks. These harsh environment enclosures can be used indoors and outdoors, are manufactured from high-quality and lightweight plastics, and are rated IP 65 and in full compliance with IEC 62208. Five basic housing sizes are available with the capability to allow for different internal heights. Accessories enable customization for any application. The enclosures can withstand temperatures from -35° C to more than 80° C.
For applications with widely changing temperatures and/or condensation risks, the enclosures can be equipped with innovative air ventilation elements to provide a permanent air exchange and protection against the elements. The enclosures can be mounted using integrated internal fixing points or optional external fasteners. Accessories include DIN rails, mounting plates, front panels, and dividers, which can be installed using a unique tool-less mounting system.